In Austria, the use of motorways and expressways is subject to payment of a toll. All motor vehicles with a maximum permissible gross weight of up to 3.5t – cars, motor bikes and campervans – are obliged to display the mandatory toll sticker. Depending on the type of toll sticker they have purchased drivers may use the toll road network for a specific period of time. You can buy 10-day, 2-months or year stickers. Points of sales at Asfinag. Tauern Motorail - Austrian Federal Railways. Tauern motorail your car or bike through the Tauern tunnel. Connects the Gastein (Bockstein) in Salzburg with the Mölltal (Mallnitz) in Carinthia and is the congestion-free alternative to the Tauern motorway. TimeTable and prices ..
Grossglockner High Alpine Road. The most famous alpine road leads you into the heart of the Hohe Tauern National Park, Austria's highest mountain, the Grossglockner (3,798 m) and its glacier, the Pasterze. On 48 kilometers of high alpine road with 36 bends, and an altitude ascent to 2,504 meters you will find a driving and nature experience of a special kind! Due to the pitch for caravan teams not recommended. Tolls. Katschberg road B99, on the Radstadt Tauern Pass. Munich to Villach approximately 340 KM: The direct alternative route can is only for cars without trailers. Pass Thurn the Felbertauern tunnel . This route is ideal for drivers coming from the Inn valley motorway (A12). For the Felbertauern tunnel tolls of about 10 euros will be charged for cars. 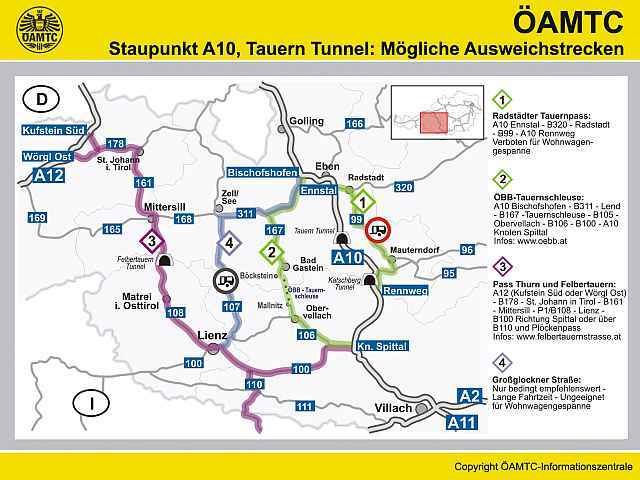 Villach can be reached via the A2 (E55) via Udine. Udine - Villach km approx 131st Motorway Villach Faaker / lake. A2 motorway (E55) to Villach. Motorway Villach / Faaker See.